Over the next two decades, the global commercial aircraft fleet size is expected to grow at a CAGR of around 4 per cent. 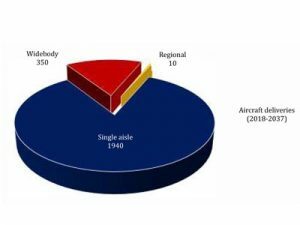 Around 45,000 new aircraft are likely to be delivered globally between 2018 and 2040, suggests a report ‘Vision 2040 for the civil aviation industry in India’ by FICCI and KPMG. The growth will be driven by socioeconomic changes in emerging economies, especially in India, China, South East Asia and the Middle East. These factors include rising incomes and aspirations, lower oil prices, fierce competition between airlines and increasing value of ‘time’. For India, Boeing raised its long-term forecast for commercial airplanes to 2,300 new jets – valued at $320 billion – over the next 20 years. Nearly 84 per cent of those are expected to be narrow bodies. According to Boeing, with more than 5 per cent of the world’s fleet expected to operate in India by 2037, commercial services like flight training, engineering and maintenance and digital analytics etc., will be the key drivers of growth. In the South Asian market, including India, Boeing forecasts a commercial services market valued at USD 430 billion over the next 20 years. 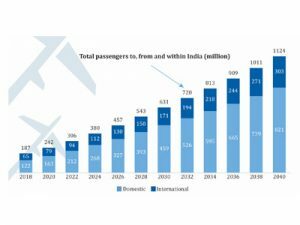 The total passenger traffic (to, from and within India) in India is expected to rise nearly six-fold from 187 million in FY2018 to around 1124 million in FY2040, according to a latest report by FICCI-KPMG titled ‘Vision 2040 for the Civil Aviation Industry in India’. This includes around 821 million domestic passengers and around 303 million international passengers (to and from India). The overall CAGR across the five clusters works out to around 9% in domestic and 7% in international traffic during FY 2018-2040. “The FICCI-KPMG projection is higher than the projections made by leading organisations. Given the untapped potential of the Indian aviation market and the signi􀃶cant reforms being driven by the federal and state governments, we feel that the above projections are eminently achievable. These are of course predicated on the assumption that volatility in oil prices and exchange rate will be within a reasonable range and the constraints in terms of policies, taxation, infrastructure and ease of doing business shall be addressed on priority,” the report states.